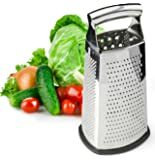 The OXO Good Grips Potato Masher features a Cushioned Handle that absorbs pressure while you work, plus a sturdy stainless steel wire head. The Masher is great for potatoes, yams, carrots and other root vegetables. Or use it to mash apples and bananas for homemade baby food. Large in-handle hole for hanging storage. Dishwasher safe. This thing mashes. It does the job that's for sure. I also like to wield it at my husband and threaten to brand him with it. Not sure if it has any value as a "branding" tool though. TBD. For guacamole though it cannot be beat! I mash the hell outta those avocados. It's got a really solid heft to it and the wires are far apart enough that it's really extremely easy to clean. Doesn't seem like it'd be easy to hurt it. We put ours in the dishwasher, not sure if that is recommended but ours survived just fine on the bottom rack. 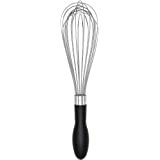 5.0 out of 5 starsGreat price, great masher - gets the job done easily! I wanted to get a great potato masher for my girlfriend, who got into making a delicious mashed cauliflower/potato (~50% of each). 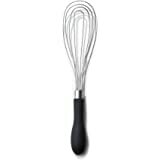 Until using this masher, she was using a rubber whisk! I have to say, this masher does exactly what it needs to do - great mashing ability with no frustrating build-ups of potato (or cauliflower) while you are mashing. Much better than our previous tool of choice. This masher is also very easy to clean by hand, as there are not any tight spaces that are hard-to-reach. Also, it's dishwasher safe if you prefer that. Overall, a great masher for the price, and I would not hesitate to recommend it to anybody. I have loved the OXO brand since my first purchase of an OXO product almost 10 years ago. I have since replaced pretty much every kitchen gadget I own with the OXO Brand. Yes... this is just a potato masher... but it is built with the home cook in mind. See in the picture the little "ridges" on the handle? 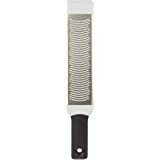 They act as a kind of a brake (for lack of a better description) for your hand so the masher won't slip in your hand and all of the energy will be used for actually mashing potatoes... not holding on to the masher! The metal seems to be pure stainless and is amazingly sturdy. This masher will hold up to years of use I'm sure and I'm very pleased with my purchase. I had the old fashioned masher for 40 plus years, moving it around from one drawer to another. A grandchild asked for it and since I had used an electric mixer for years I readily handed it over. Then, I read one of those "tips" that sent me looking for a replacement. The "tip" was to use the masher to break up hamburger when cooking it. Who hasn't struggled with breaking up hamburger while cooking it? Imagine my surprise when I couldn't find a replacement in stores? Well, I may be 70, but I know about Amazon/ebay so I did what any savy person would do, I went looking on line! 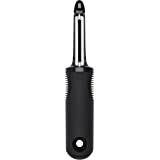 The OXO Good Grips Wire Potato Masher is made every bit as well as my original masher. It works great for breaking up hamburger and I could not be more pleased with it. 4.0 out of 5 starsA must have in the kitchen. A sturdy and multipurpose tool. Essential tool for the kitchen. The only thing that I think would improve it would be if the shank were a little longer; it you are trying to mash potatoes in a large pot (anything over 8 inches in depth) it becomes a little awkward to work with. Other than that I love it.